The Huawei Mate 10 is set to be one of the biggest flagship phones of the year, and we’ve now seen a new set of images, suggesting it might be even bigger than we’d previously thought. The renders, which were obtained by reliable leaker @OnLeaks on behalf of CompareRaja, are apparently based on a factory CAD (computer-aided design), and show the Mate 10 with a fingerprint scanner below the screen. Why does that matter? Because the only other leaked images we’ve seen so far show the scanner on the back, with an all-screen front. That means we can’t be sure which set of images are accurate, but it also means that if these latest ones are then the Huawei Mate 10 could be a real handful, given that the source claims it will have a 5.9-inch display, and the scanner below will take up additional space. The images also show a dual-lens camera that juts out a bit, and a slightly curved back that’s likely made of glass. 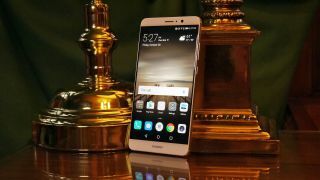 The Huawei Mate 10 is also pictured with a USB-C port and a 3.5mm headphone port, and will apparently come in at 150.2 x 77.5 x 8.4mm, which would make it slightly smaller than the Huawei Mate 9. That’s surprising, given that phone’s scanner was on the back and it too had a 5.9-inch screen, but the Mate 10 will still be huge if those dimensions are right, coming in larger in every way than the 5.8-inch Samsung Galaxy S8. This leak doesn’t reveal anything else about the Huawei Mate 10, but previously we’d heard that it could have a top-end Kirin 970 chipset, a 2,160 x 1,080 display, an iris scanner and 3D facial recognition. And you shouldn’t have to wait too long to buy it, as rumors suggest the Mate 10 will be announced on October 16.